One winter day in 2009, a little guide dog puppy named Joyce said goodbye to her mom, brothers, sisters and friends at my local guide dog organization and began her adventure with my family. Each guide dog puppy was going off to live with a volunteer "puppy walker family." 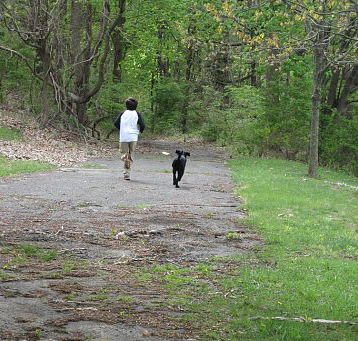 Puppy walker families care for the puppies and teach them basic obedience behaviors with the help of formal classes and animal behavior specialists. 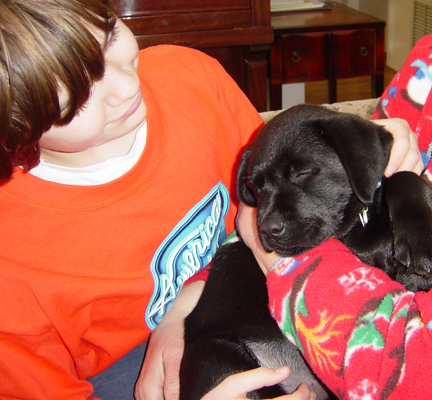 The families give the puppies lots of love and introduce them to many life experiences. When the puppies reach 12 to 15 months old, they are recalled to live at the center where they begin their formal guide dog training. Joyce was loved right from the start! We taught her to sit, stay, pee and poop on cue, and many other behaviors that would form the basis of her training to become a guide dog. 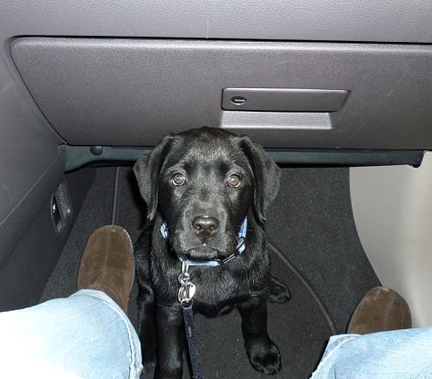 Because Joyce was a guide dog puppy she went everywhere with us. She happily climbed into cars, vans, trains, even a barge and a small plane. She went to shopping malls, the dentist, the library, the post office, grocery stores, restaurants, the bank, church, and guide dog puppy school. Joyce was amazingly quiet and well behaved. There was always time for playing, romping, swimming, and having fun. Her favorite adventures were playing in the surf at the beach and taking long walks. Joyce loved all of the members of her family, even the cat. Initially, the cat was afraid of Joyce. He would run away whenever she approached him. But Joyce was patient. 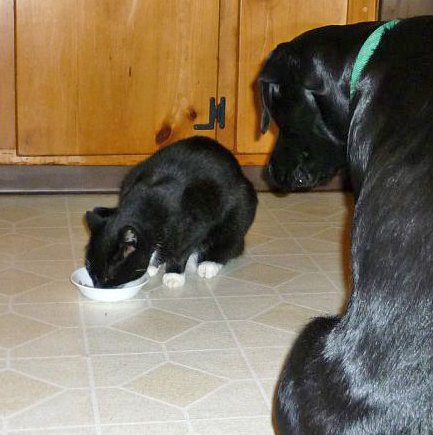 Day after day, week after week, she was gentle and considerate of the cat. Sensing his apprehension, baby Joyce would lie down quietly whenever the cat was nearby. Finally, one day, the cat rubbed against Joyce and purred. They were friends at last. Joyce was very intuitive with people as well. She seemed to judge the level of energy to use with each individual she met from exuberant teenagers to very young children to frail, elderly people. Joyce enjoyed going to guide dog puppy classes. Each class was held at a different location, like a train station, a hardware store, a fire station, or a pool. At class, she got to see her brothers and sisters and her trainers. The trainers taught the puppy walker families how to work with the puppies. 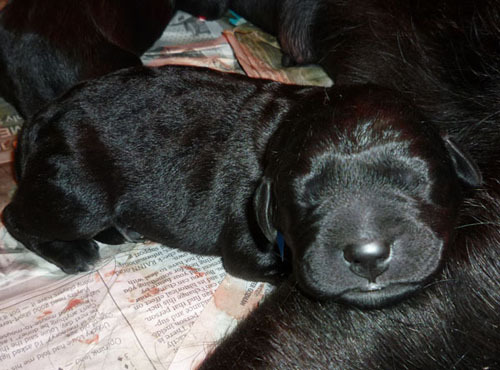 Guide dog puppies are trained using consistency and lots of positive reinforcement. 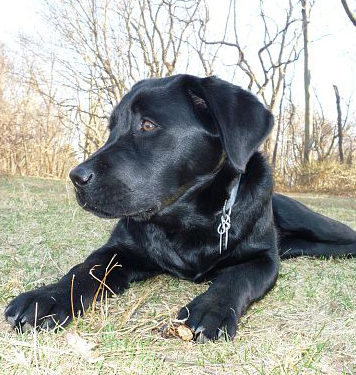 When Joyce was 12 months old, she was recalled to begin formal guide dog training. It was very hard for us to say goodbye, but we felt lucky to have had the chance to know and love such a wonderful dog! I did this in 2009 - 2010. Almost two months after Joyce returned to the guide dog organization, I received a phone call. Joyce had been chosen for a very special honor. Because of her wonderful demeanor, she had been selected to be a guide dog breeder. The guide dog organization needed to place her in a loving home. They wanted to know whether we would like to continue to care for her. Of course our answer was yes! For the next year and a half, we continued to love and care for Joyce, and she continued to demonstrate her incredible intelligence and dedication to helping others. 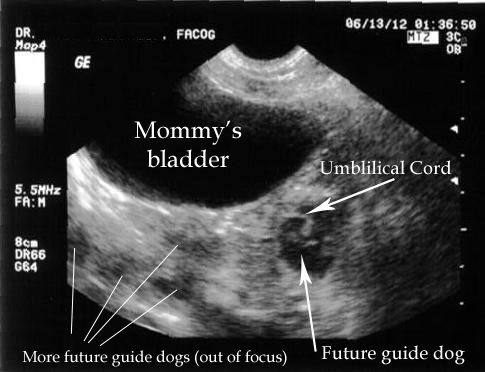 On June 13, 2012, a few weeks after the first attempt at breeding, an ultrasound showed that Joyce was pregnant. 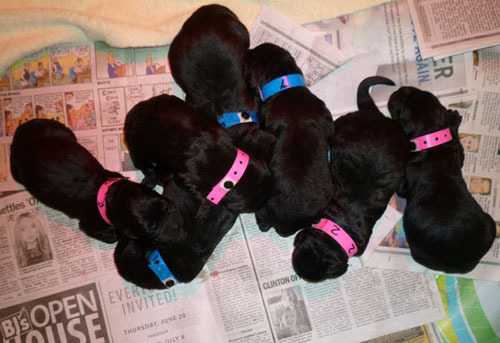 On July 19, Joyce gave birth to seven beautiful guide dog puppies, four girls and three boys. They weighed from 1.2 to 1.35 pounds each.